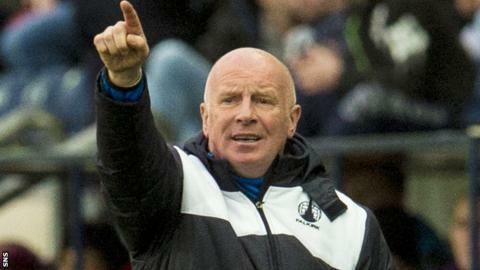 Falkirk manager Peter Houston has agreed a two-year contract extension and been backed to lead the club to promotion to the Scottish Premiership. The 57-year-old, plus coaches Alan Maybury and James McDonaugh, has agreed a deal until the summer of 2018. Chairman Doug Henderson told the club website: "We will continue to invest in our team and in our facilities as we push for a return to the Premiership. "And we believe this will be achieved under Peter's management." Houston, who previously managed Dundee United, took charge in 2014 after Gary Holt left to join the coaching staff at Norwich City. "There's no doubt that the club has moved forward under Peter's management, with a strong performance in reaching the Scottish Cup final last season and in our current position as second in the Championship promotion race," said Henderson. Houston, who was named Championship manager of the month after an unbeaten December, was delighted to extend his stay with the club for which he played as a striker. "It has been a very enjoyable experience so far," said Houston, whose side trail leaders Rangers by three points. "We can now plan and prepare for the next two years as a coaching unit. It's an exciting time for the club and I very much feel it is a club on the up. "We ultimately want to get this club back to the Premiership and I look forward to continuing the challenge of doing that."